Garnished with fresh raspberries and mint leaves and arranged in the shape of a tree, these tasty lemon custard cream puffs make a great presentation! Bring 1 cup water, butter and 1 tsp. granulated sugar to boil in medium saucepan. Add flour; cook and stir 3 min. or until mixture forms ball. Spoon into large bowl. Beat in eggs, 1 at a time, with mixer until blended. Spoon into freezer-weight resealable plastic bag; cut 1 corner from bottom of bag. Use to squeeze dough into 17 (1-1/2-inch) mounds on baking sheet. Bake 45 min., reducing oven temperature to 350ºF after 20 min. Turn oven off; open door slightly. Let cream puffs stand in oven 15 min. Remove from oven; cool completely. Meanwhile, bring remaining granulated sugar and water to boil in medium saucepan on medium heat; cook on medium heat 8 min., stirring constantly. Remove from heat. Add dry gelatin mixes; stir 2 min. until completely dissolved. Add evaporated milk, lemon zest and juice; mix well. Refrigerate 45 min. or until slightly thickened, stirring occasionally. Gently stir in COOL WHIP. Cut cream puffs horizontally in half with serrated knife. Gently remove tops; remove and discard soft dough from centers. Spoon COOL WHIP mixture into bottom halves of cream puffs; replace tops. 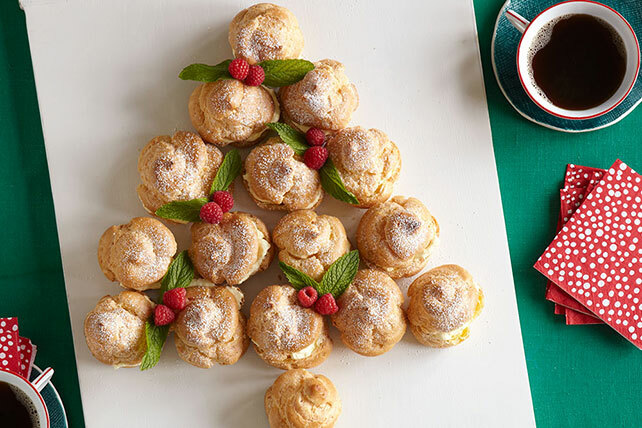 Arrange 15 cream puffs on platter to resemble Christmas tree shape. Add remaining puffs at bottom for the trunk. Sprinkle tree with powdered sugar. Garnish with raspberries and mint. This festive dessert is sure to bring a smile to your guests face at your holiday celebration. Cream puffs can be baked in advance. Cool, then store in freezerweight container up to 1 month. Thaw at room temperature, then use as directed. Once thawed, they can not be refrozen. Prepare using JELL-O Orange Flavor Gelatin. Use a pastry bag fitted with desired tip to fill the cream puffs instead of the plastic bag.